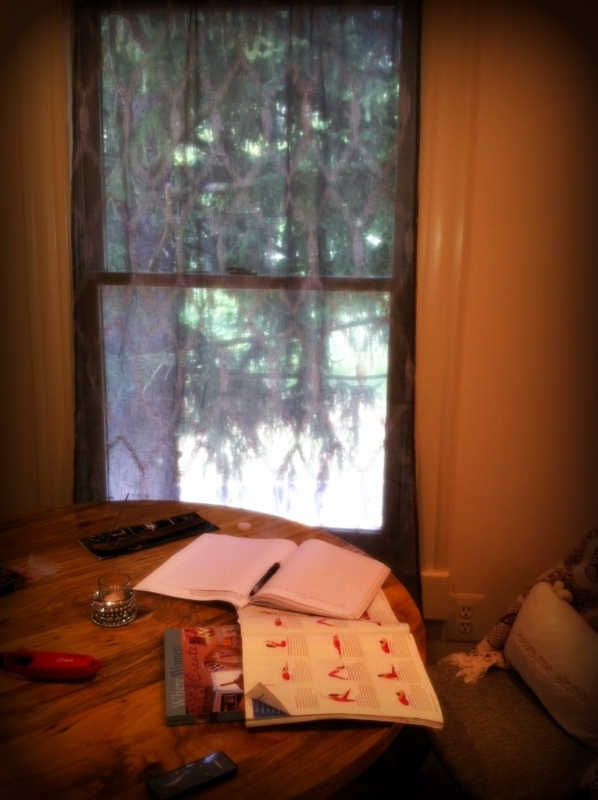 I sit on the second level of my gallery this late afternoon and start writing my first essay here in the writing room. Through the grey see-through curtain, I can see the giant tree hovering over this yellow historic house that’s trying to become something. For the first two months it desperately wanted to become an art gallery. It only took one exhibit for me to get burned out from all the work that went into it. After almost two weeks of contemplating, I decided to shut down the gallery, only to change my mind again and choose to keep it running for a while longer. This time, with an actual business plan and a different platform. But what does this space want to be? I try to envision a dream this place has. Unfortunately, I feel many dreams. This house is a dreamer, and wants to be many, many things. So to resolve my dilemma, I have been coming to this very special room I have separated from all the other rooms for just one purpose: writing. From the first day I walked in this house, I knew this would be my room. I loved the entire house; the openness of the ground level space, and the beautiful wooden staircase leading me up to the second level, and a pure, bright room with kitchenette in the corner. But my absolute favorite was this room that I am sitting in right now. It faces the big tree directly, which blocks the day light, and as a result, the space stays dark and cool throughout the day. It’s a perfect space for HSPs. Not only that, you can feel the greenness of the tree, and it almost feels like you are in a tree house. You can feel the persistent calmness, and the unstirred strength coming from the tree. Every time I step into this space, I am immediately transported by the deep current of creativity running through this space and arrive at a place of sacredness. So inside the sacred room, I ask the question again. I am trying to communicate with this yellow house. I listen to the silence for a few minutes and then ask again. Tell me, what is it that you want to become? I have been doing this for the last two weeks almost. Until I get my answer, I will not stop asking. Either the house will give in to my persistence, or I will give in to my whimsical mind. I know I will do something with this space. And that is the scary part as my first experience of creating a gallery has proven very thoroughly. I had just paid my rent for the month of August. On my short walk from my landlord’s office to my yellow house, I thought, ‘This business better start generating some income. Or I will be out of business again very soon for the second time.’ Once was enough. I do not want to repeat that shame ever again. I am reminded of something I have read a couple of nights ago. In her book “Bright Side Up”, the author Amy Spencer suggests asking your one-hundred-year-old self when faced with important decisions that will shape the future of your life. She asks “the wrinkled, wise person she will be blessed to become, sage in experience, a survivor of bad choices and missed chances, the one person who can look back on her life and see where she went wrong, got scared, or grew weak.” : What should I do? I try to ask my one-hundred-year-old self, too. But I know better than to trust myself, even if I am my wise one-hundred-year-old self. I go directly go God and ask him. God, what does this space want to become? What would you have me do with this yellow house? What is your vision? But no answer. Maybe it is there, and I am just not catching it. Maybe this is not an idea God has bestowed on me. I don’t know. I don’t think I would ever know even if I become my one-hundred-year-old self, the sage, the experienced, and the survivor that I might become one day. But somehow, instead of my old-self, I keep focusing on one-hundred-year-old(perhaps older) tree just right out my window. I am sure it started out as one small seed. But look at it now. I am sure it never try to be something it is not. It just kept growing and growing rooted in one place, in the tiny piece of land where it was first conceived. But look at it now. The tree was trying to tell me something. I still don’t know what I want to do with the space given to me. But I know what I am not going to do. I am not going to try to be what I am not. I am not going to try to make this space what it is not meant to be. That is the promise I make with God, with myself, with my one-hundred-year-old self, and the one-hundred-year-old tree, and this beautiful yellow house that’s more than a hundred years old. When I was starting my business over 2 years ago, I found it helpful to talk to a successful small business owner and get his perspective on questions about what I should/could and shouldn’t/couldn’t do. I talked to trusted family members and to my spiritual director. Often when we have a big decision to make, getting the perspective of trusted people helps. They won’t tell you what to do but they can help clarify your questions and doubts.